It is basically a nice, simple wooden box about 10 by 4 by 3 inches, which accepts short paper strips of hole-punched music to play songs on a 20-note comb. The paper strips are about 3 inches wide by 18 inches long, and in order to make the holes in the strips you have to punch the little black dots out yourself (with a sturdy, included hole puncher). A hand-crank mechanism rolls the strips through the box and over the comb. After a bit of detective work in Utrecht (before visiting the mechanical music museum there) I found two more of these mechanisms for sale and bought them both without a moment's hesitation -- just the mechanisms and the hole-punchers, with no wooden cases. 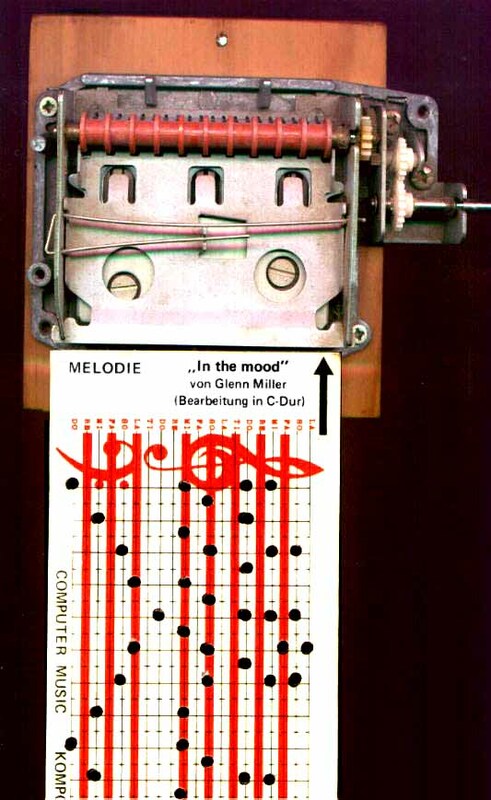 The shop in Utrecht actually sold several other pre-coded "punch-it-yourself" strips for this device, mainly German songs, and they also had a few grid-lined "blanks" so I could start experimenting with making my own music strips. At this shop I also discovered the whimsical name by which this system is known in Germany and the Netherlands: "Pling-Plong". Oh, the joy of staying up until four in the morning with my music box and my two blank card strips, punching away into the night until I had produced a short original ragtime piece on one card, and a lullaby my grandmother used to sing on the other! Oh, the elegant madness of picking bits of paper-punch confetti out of my hair and off of my clothes, as each successive "punch" sent a tiny disc of paper soaring into parts unknown... Has any music box ever sounded as sweet to my ears as this, dutifully playing my own compositions and arrangements, coded and card-punched only minutes before? I sense a new obsession growing within my mind, and its name is "Pling-Plong." At the Mechanical Music Museum in Utrecht, I found that the gift shop also sold unhoused pling-plong mechanisms, and had stacks of grid-lined blank cards, four for one guilder. I bought fifty of them, and I think I can probably make my own in the future. The museum even has an entire room dedicated as a pling-plong workshop, where you can sit down with blank cards, a puncher, a pling-plong, and some hard plastic templates, and reproduce pling-plong compositions from the templates to try out for yourself. What amazes me is that very few people in this forum had ever heard of this little gadget -- if the number of responses I received is any indication -- when, in fact, the system seems to have a strong presence here in Europe. Are there any other closet pling-plongers out there in the MMD or the MBSI? Is there some kind of pling-plong club, society, or support-therapy group I can join? "Pling plong pling plong pling plong"
The manufacturer is actually Sankyo Seiki (Hong Kong) Co., Ltd., and the part number for the mahogany finished music box, crank model (called Organette 20" on the bottom of the box), is OA-108-S-058. Mine came to me through the kind assistance of Andrew Van Schaack, who wrote to me last November about the box he had found in a Tokyo department store. We were feeling the pains of being music-box-less, so he agreed to send one to Illinois. Obviously this is not an economical way to do things, because the boxes cost more in Tokyo than anywhere else in the world, but it was a rewarding adventure. Since the strips come in three forms: punched, marked for punching and blank (lines for composing and punching), I had a great time making strips, keeping the blank ones and using file folders for my own tentative arrangements. My favorite is "Suo Gan", the Welsh lullaby. This is quite well worth visiting, with links to other Japanese music box pages. The tunes are very fine and are of his own composition. There is also a nice photo of the mahogany music box. I scanned my strip of "Suo Gan" and posted it back to Andy, and I'm including it and a MIDI file expertly keyboarded direct from the scanned image by the inimitable Robbie Rhodes. Since there is no site for this material, and since the point of having such a box is being able to code your own arrangements, I would suggest we have an "Organette 20" spot on the MMD site. I do not envy Andy's wish to punch Clair de Lune by Debussy as heard in "Seven Years in Tibet". This is probably not possible with only a two-octave scale with no chromatics. I think it easiest to stick to bagpipe and pennywhistle tunes, but think there must be another instrument and literature out there which makes use of this limited scale but more than a single note melody. The 20 notes play a 2-1/2-octave diatonic scale (i.e., only the white keys of the piano), beginning at C and extending to G, as C-C-C-G.